For me, it’s hard to imagine a love greater than the love of my parents and spouse. For others of you, it may be difficult to fathom and love greater than that of your best friend, or sibling. God’s love for us, just like His love for the Son is unfathomable. It’s truly a miracle in itself. Lamentations 3:22 depicts God’s love as infinite and never ceasing. Each day, every minute of our lives, God is loving us, thinking of us, and planning for us. God is, as you know, the very definition of love. No matter how many times we sin, or run away, or are just plain mean, He is there, waiting. I can’t help but feel a little overwhelmed by the knowledge that He has claimed me as His own. In an earlier post, we reflected upon God penning our names in His heart. The very idea of God knowing my name AND calling me his daughter is humbling to say the least. I certainly do not feel worthy of the honor. But, that’s one of the reasons why I was so excited to write about this topic. I feel, as I’m sure other women do, that God can, at times, be unattainable and unreachable. 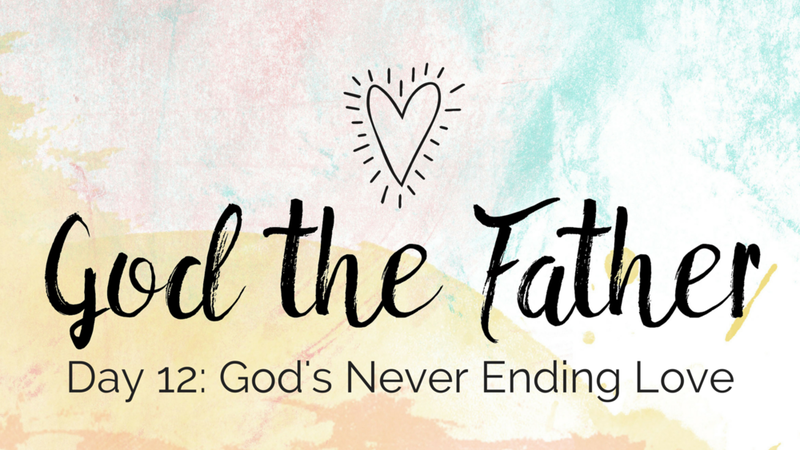 By painting Him as the Father, and not “Some spirit in the sky” as Norman Greenbaum put it, we are able to get excited about our role as a child of God. We can keep God close to us all day long and bring Him with us into our darkest days. The past few days have been all about the Father and how He has called us to be His. It’s scary and exciting all at the same time. Will we disappoint him from time to time? Probably so. Will we come home late from curfew a time or two? Definitely so. But, thanks to God and His unending love, we have the opportunity each and every day to start again and become the best person that we can possibly be. Because of His infinite grace and mercy, we have the ability to serve others and God in ways we never thought were possible. As children of Christ, we can truly be loved, be free, and be held. I truly hope these last few days have helped you become more aware of all of the wonderful gifts God has to offer us. Reflect: Do you feel God is more accessible when we think of Him as Father figure? Act: Give yourself some much needed grace for something that you have recently failed at. Sometimes my son has nightmares and calls out in the night for me. The fear in his voice is so palpable I break out into a cold sweat myself as I run into his room. The Fourth Commandment directs us to honor our mother and father. We are instructed to be obedient and to love them with all of our heart. Do you have someone that you look up to? That, if given the chance, you would like to become just like them? a lot while swimming competitively, but man do I love to eat! After a really good family meal, I feel not only physically satiated, but emotionally as well. The meal itself doesn’t have to be fancy. Paper plates and red solo cups will work just as well as fine china. What can’t be replaced though is my dad’s funny laugh, the scent my grandma leaves when she hugs me, the cry of the baby during prayer. These are what make a really great meal. While we eat as a family nearly every evening, a lot of times it’s rushed and meal prep can be stressful with so many people clamoring for different things in the kitchen. Our “special” family meals typically happen on a Friday or Saturday and really help heal me after a long, stressful week. God the Father wants to share special meals like this with us as well. He literally wants to feed our souls. Much like good conversation and good food can heal an emotionally difficult week, God can heal our souls with, you guessed it, soul food. But what does soul food look like? Just like everyone has a different favorite meal, soul food is going to look different for each person. Perhaps seeing the sun set on your way home from work inspires you. Or, maybe it’s finally hearing the words “I love you” from your child. It could be a well-timed hug from a friend, or a nice long telephone call with your mom. Whatever your soul food looks like, God is behind it. He paints the sky. He literally makes your kids. He whispers to your friend, “She needs a hug.” He tells you, “Go call your momma.” Whatever soul food is for you, give thanks for it and savor it. Feed your soul with His love and strength. When I had originally thought of this post, my first thought was of my son saying “Um, mommy, I’m hungry.” Or my favorite (not), “Mommy, I need a snack…now!” At first I thought it was just something funny that didn’t really have a place in my post. But then I began to think of my response to him, “You’ll ruin your dinner if you eat those cookies.” “You’ll have to wait until I’m done fixing breakfast/lunch/dinner to eat. You don’t need a snack right now.” This got me thinking. Do we “snack” in our spiritual lives? Do we fill up on junk and not leave room for the Father to fix a really nice meal for us? I know I do. I get so caught up with work, and all of my responsibilities, that I don’t take the time to savor the wonderful meals God has prepared for me. Mass on Sunday? Rush to get the kids dressed, rush to get there on time, rush out to get lunch made and kids in bed for their naps. Rush, Rush, Rush. Did I take time to savor mass, or was I distracted by my responsibilities? Unfortunately, this happens more than I would like to admit. I can’t help but feel as though my spiritual life, and my relationship with the Father would be so much richer if I took the time to not only eat, but savor the feast He has set out before me. I think the primary way we can achieve this is to stop snacking and filling our lives up with junk. God has the ability to fill us up, just like a good meal can. I think we should definitely take Him up on this, and make a standing reservation. Reflection: When was the last time you had a good meal? What elements made it good? Reflection: What kind of junk gets in the way of feasting on what God has to offer? Act: Call a friend or family member and check in on them. Perhaps God can feed their soul through your kind words. Teach me Lord! Show me how you want me to live my life! Just as a child learns from those closest to him, we too can learn from the Father if when we draw near to Him. As a child, I shoveled manure, shucked corn and dug potatoes on my grandparents’ farm. I certainly learned to not be afraid of getting dirty! I think the Father teaches us a similar lesson in our spiritual lives. Our lives are not easy. They are indeed work, and the work can be dirty and sweaty. Our relationship with Christ is work. We are judged, taunted, and ostracized for our relationship. These obstacles are all in a day’s work as a disciple. God teaches us that if we put in the work, if we have faith, we will reap the rewards. What would our lives look like if we weren’t afraid of the work? What would our lives look like if we said “Teach me. Lead me.”? I know if I lived this every day, my life and heart would change for the better. Using God’s example I would forgive more easily and love more deeply. I would stress less and see the good in people first. Let your heavenly Father lead you through your journey. Let Him show you the path that He has so thoughtfully and lovingly laid out for you. Learn from His example and apply those hard learned lessons every chance you get. Reflection: What do you think of the path that your life is on right now? Reflection: Do your plans for the future include the Lord? Act: Think back on your last week. What lessons has the Lord been trying teach you through your daily experiences? Patience, love, diligence? Attempt to apply those lessons to your daily actions going forward. Just as we seek Jesus through Mary, we can also seek God through Jesus. Have you ever gone through the day feeling unappreciated, unloved, or worse yet, unnoticed? As a mother, I have seen firsthand how my child loves me with his unparalleled enthusiasm. Even when I have failed miserably as a mother, my son still runs to me with open arms. How do you view God? Do you see Him as an ever powerful, almighty, and overwhelming being in the sky somewhere?